The tumor suppressor gene CDKN2A generates at least three different transcriptional variants, each of which is thought to encode a tumor suppressor. However, the inhibitory activities of these variants have not yet been compared in the same cells. Protein therapy is known to have several advantages over gene therapy. Thus, investigation of the exogenous protein molecule of the most effective suppressor may yield meaningful information regarding protein-based cancer therapy. The inhibitory effects of p16INK4a, p14ARF and p12 were studied in the human lung cancer cell line A549 which lacks the CDKN2A locus. The eukaryotic expression plasmids of the three transcriptional variants were constructed and stably transfected into the cells. RNA and protein expression by the plasmids was confirmed using RT-PCR and fluorescence immunocytochemistry, respectively. Cell growth inhibition and cell-cycle redistribution after transfection were investigated based on growth curve and flow cytometry analyses. An exogenous His-tag fusion p16INK4a protein was obtained and purified by affinity chromatography. Cell growth inhibition and cell cycle arrest induced by the expression of p16INK4a protein were measured in A549 cells transduced with the exogenous protein. While all three variants suppressed cell growth, p16INK4a had the strongest effect. Marked G1-phase accumulation and S-phase inhibition were induced by p16INK4a and p14ARF but not by p12. Exogenous p16INK4a protein was successfully expressed and purified and transduction of the fusion protein into A549 cells inhibited cell growth by G1→S arrest. Among the three transcript variants, p16INK4a has a greater inhibitory effect than p14ARF and p12; exogenous p16INK4a protein should be further investigated for use in cancer therapy as a protein agent. The cell cycle is a strictly ordered process regulated by positive regulators, including cyclins and cyclin-dependent kinase (CDKs), and by negative regulators, such as cyclin-dependent kinase inhibitors (CKIs) . There are two tyepes of CKIs: the INK4 family, which includes CDKN2A, and the CIP/KIP family, of which, p21, directly inducible by p53, is an example. Cell cycle regulators are frequently mutated in many types of cancers such that cancer is now considered a cell cycle disease. Accordingly, cell cycle regulators have become an important focus in carcinogenesis research and cancer therapy. The tumor suppressor gene CDKN2A, located at 9p21, generates at least three structurally and functionally unrelated transcriptional variants: p16INK4a, p14ARF and p12 . In terms of structure, p16INK4a and p14ARF share the exon 2 and 3 but use unique first exons and utilize different reading frames. p16INK4a utilizes exon 1α and p14ARF utilizes exon 1β which is 20 kb upstream of exon 1α. p12 is a splice variant of an alternative donor splice site within intron 1 of p16INK4a which contains exon1α and a novel intron-1-encoded C-terminus. (Figure 1). The protein products of these transcripts function via different pathways. p16INK4a specifically binds to the cyclin-dependent kinases CDK4/6, thereby inhibiting the phosphorylation of the retinoblastoma protein (pRB) and causing cell-cycle arrest at the G1 phase . p14ARF interacts with MDM2, which targets p53 for degradation, thereby inducing p53-dependent cell-cycle arrest in both G1 and G2 phases [6, 7]. p53 participates in a wide range of activities including growth arrest, DNA repair and apoptosis and nearly 50% of human tumors have defects in p53 . 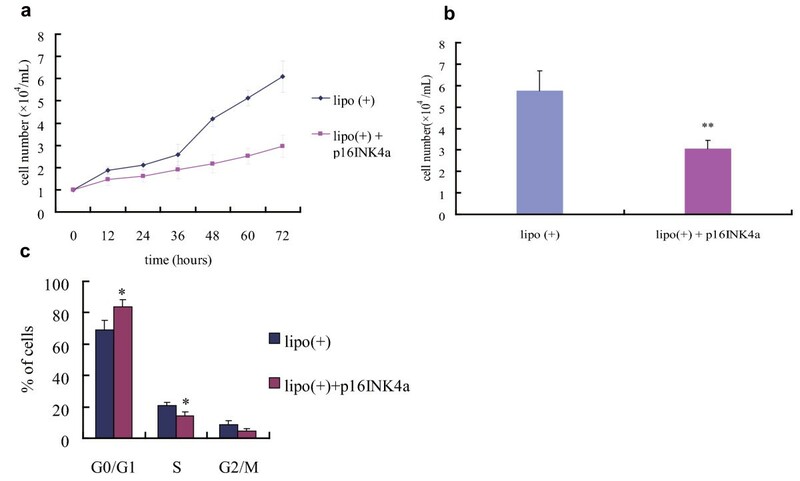 Less is known about p12; pRB-independent growth suppression by p12 was reported in pancreatic cells, but the tumor suppressive and cell-cycle effects of this protein are as yet unclear . The three transcriptional variants of CDKN2A. The CDKN2A gene located at 9p21 generates three transcriptional variants at transcription: p16INK4a, p14ARF and p12. p16INK4a utilizes exon1α, and p14ARF utilizes exon 1β which is about 20 kb upstream of exon 1α. p16INK4a and p14ARF share common exon 2 and exon 3 but use different reading frames. p12 uses an alternative splice donor site within intron1 of p16INK4a. The CDKN2A locus is frequently inactivated in a wide variety of tumors[9–12]. Kamb examined 290 tumor cell lines and detected CDKN2A deletion in 133 of them . Park examined 31 non-small cell lung cancer (NSCLC) cell lines and found that the inactivation rate of p16INK4a and p14ARF was 84% and 55% respectively. Significantly, p16INK4a was inactivated in all cell lines in which p14ARF was inactivated. Conversely, restoration of the transcripts in tumors with endogenous expression deficiency has been shown to reverse the malignant phenotypes of many tumors. In lung cancer cells, for examples, Zhang X et al restored the expression of p16INK4a in A549 cells and showed that p16INK4a could suppress cell growth and block G1-S cell cycle transition both in vitro and in vivo. Elevated p16INK4a protein expression also enhanced the sensitivity to cisplatin treatment of NSCLC cells. Xie Qi-chao et al co-transfected p16INK4a and p14ARF into the A549 cells and found that cell growth arrest and apoptosis were induced . As for p12, little is known about its status and tumor-suppressive effects. Keith et al transfected a p12 eukaryotic expression vector into C-33A and PANC-1 cells and found that the expression of the protein suppressed cell growth by 40% and 60%, respectively, and found no relationship with RB state. While all three transcripts are potential tumor suppressors in different genetic backgrounds, they may have different effects and mechanisms. So far, the activity of the transcriptional variants under the same condition has not been studied, nor is it known which variant has the strongest suppression effect. Along with gene therapy, the use of protein therapeutic agents is rapidly developing[19, 20]. More encouragingly, protein therapy has been shown to overcome the drawbacks of vector-associated toxicity and immune responses associated with gene therapy and to avoid its delayed therapeutic impacts due to the need for transcription and translation of the encoded protective protein. It is therefore meaningful to identify the most effective and useful suppressor for future applications as a protein therapeutic agent. Here, the different growth inhibition effects of p16INK4a, p14ARF and p12 were investigated in a study that included the exogenous expression, purification and function of the p16INK4a protein. Our results demonstrated the different effects of the three transcripts on cell growth and their activity at different phases of the cell cycle. Among the three variants, p16INK4a was shown to more effectively suppress the growth of A549 lung cancer cells. Our research on the p16INK4a protein could facilitate or improve the basic understanding of future cancer biotherapy with the p16INK4a protein. The human lung cancer cell line A549, deficient in the CDKN2A locus and wild-type in RB and p53 , was obtained from the Cell Resource Center of the Shanghai Academy of Sciences The cells were cultured in F12-K medium (Sigma-Aldrich, St.Louis, MO) supplemented with 10% fetal bovine serum (FBS) (GIBCO BRL) in a humidified 5% CO2 air incubator at 37°C. Full-length fragments of complementary DNA (cDNA) corresponding to p16INK4a, p14ARF and p12 were obtained by reverse transcription polymerase chain reaction (RT-PCR) from AGZY and H446 cells and normal pancreas tissue, respectively, which were positive for the respective transcript. The PCR products were cloned into pGEM-T vector (Promega, Medison, WI). The PCR products were cloned into the vector pGEM-T (Promega, Medison, WI) and the transcripts PCR-amplified using primers containing the same restriction-enzyme sites as the clone vector plasmids. Primers for p16INK4a were 5'-CCCAAGCTTGCATGGAGCCGGCGGCG-3' and 5'-CGGGATCCCTTTCAATCGGGGATGT-3'. Primers for p14ARF were 5'-CCCAAGCTTAGATGGGCAGGGGGCGG-3' and 5'-CGGGATCCCTCCTCAGCCAGGTCCA-3'. Primers for p12 were 5'-CCCAAGCTTGCATGGAGCCGGCGGCG-3' and 5'-CGGGATCCCCTCATTCCTCTTCCTT-3'. The PCR products and pcDNA3 vector were double-digested with HindIII and BamHI (TaKaRa, Japan). Eukaryotic expression plasmids were constructed, verified by DNA sequencing, and then used to transfect A549 cells using the Lipofectamine 2000 transfection reagent (Invitrogen, Carlsbad, CA). Transfection of the empty pcDNA3 vector served as the control. The stably transfected cells were screened by adding 600 mg G418/L for 14 days. Positive cell clones were selected and gene expression subsequently confirmed by RT-PCR (with the same primers as described above) and fluorescence immunocytochemistry analyses. p16INK4a cDNA was PCR-amplified from clone vector plasmids with primers 5'-TACCGAGCTCGGATCCCGGAGAG-3' and 5'-GTCTCGAGCATGCATCTAGAG-3'. The p16INK4a cDNA and the pQE-31 vector (QIAGEN) were double-digested with BamHI and SphI (TaKaRa, Japan). The PQE31-p16INK4a plasmid was constructed and transformed into BL21(DE3) competent cells. The positive clone (confirmed by DNA sequencing) was grown at 37°C in LB medium supplemented with 100 mg ampicillin/L until the absorbance at 600 nm reached 0.6. Protein expression was induced overnight at 25°C with isopropy-β-D-thiogalactoside (IPTG) at a final concentration of 0.1 mmol/L. The Cells were harvested, resuspended in 20 mL lysis buffer (0.5 M/L NaH2PO4, 0.5 M/L Na2HPO4, 29.3 g NaCl/L, pH 7.4), lysed by ultrasonication and centrifuged at 12,000 ×g for 30 minutes at 4°C. The supernatant was loaded onto a Ni2+-Agarose column. Nonspecific binding was removed with washing buffer (50 mmol Na2HPO4/L, 0.3 mol NaCl/L, 10--50 mmol imidazole/L, pH 8.0). The His-tag fusion p16INK4a protein was eluted with elution buffer (50 mmol Na2HPO4/L, 0.3 mol NaCl/L, 20--200 mmol imidazole/L, pH 8.0). Purified protein was analyzed by 12% SDS-PAGE and Western-blotting. Protein was transduction into A549 cells using Lipofectamine 2000 reagent. After 6 h of incubation, the culture mixture was replaced with fresh medium. The transduction efficiency was verified by fluorescence immunocytochemistry. Fifty μg protein was separated by 12% SDS-PAGE and transferred to polyvinylidene difluoride membranes (Immobilon-P; Millipore, Bedford, MA). The membranes were blocked, washed, and then incubated with primary p16INK4a antibody (monoclonal mouse anti-human, Santa Cruz, 1:200) for 1 h, followed by a second wash and incubation with secondary antibody (monoclonal goat anti-mouse, 1:2000) for 1 h. Bands were visualized using an enhanced chemiluminescence (ECL) detection kit (Amersham, UK). Plasmids- or protein- transduced cells were seeded on cover slips in 6-well plates at a density of 5 × 104 cells/mL. After 24 h of incubation, cells adhered to cover slips were washed in cold phosphate-buffered saline (PBS), fixed in 4% paraformaldehyde for 15 min, and permeabilized in PBS with 0.1% Triton X-100 for 15--20 min. The fixed cells were then incubated in 1:200 diluted primary antibodies (anti-human p16INK4a/p12 was from Santa Cruz (SC-468), and anti-human p14ARF from Fujian Maixin Corp., China) at 37°C for 2 h, washed, and incubated for 2 h with 1:50 diluted FITC-conjugated secondary antibodies (Beijing Zhongshan Golden Bridge Biotechnology Corp., China). The pcDNA-vector-transfected cells were stained with anti-p16INK4a/p12 and anti-p14ARF antibodies. The nuclei of A549 cells transduced with p16INK4a protein were counterstained using Hoechst stain. Transduced cells or control cells were seeded onto 24-well plates at an initial density of 1 × 104 cells/mL and then trypsinized, harvested, and counted at 24-h intervals (plasmid transfection groups) or 12-h intervals (protein transduction groups). The cell number at each time point was determined in three separate wells and experiments were independently repeated at least three times. The redistribution of cells in the cell cycle was analyzed by flow cytometry analysis. After 48 h of cultivation, transduced cells and the control groups were harvested by trypsinization, washed with PBS and fixed in 75% ethanol at 4°C for 24 h. The cycle TEST⁜ PLUS DNA Reagent Kit (BD Biosciences, San Jose, CA) was used for cell sample preparation and DNA staining according to the manufacturer's guidelines. Cell cycle distribution was analyzed by flow cytometry analysis (Bio-Rad, Richmond, CA). All experiments were repeated at least three times. All values are expressed as means ± SD. Student's t-test was used to assess statistical differences. A p value < 0.05 was considered significant. Full-length cDNAs were cloned into pcDNA3 vectors designated as pcDNA3-p16INK4a, pcDNA3-p14ARF, and pcDNA3-p12, verified by DNA sequencing (data not shown), and stably transfected into A549 cells. Positive cell clones were identified by G418 screening for 14 days and the expression of exogenous p16INK4a, p14ARF, or p12 examined by RT-PCR and immunocytochemical assays. RT-PCR of the transfected cells confirmed the presence of products of the expected sizes (493, 543, and 372 bp) (Figure 2a). Immunocytochemical assay results were in agreement with the RT-PCR results and showed significant green fluorescence in cells transfected with each of the three transcripts, thus demonstrating protein expression. The empty-plasmid group stained with anti-p16INK4a/p12 and anti-p14ARF antibodies did not show fluorescence, excluding the background signals (Figure 2b). Identification of stable A549 cell clones for RNA and protein expression.a. RT-PCR detection of RNA expression of p16INK4a (lane 1), p14ARF (lane 2) and p12 (lane 3). The products were analyzed by 1% agarose gel electrophoresis. Lane M was loaded with DL 2000 DNA marker, with sizes shown on the left. b. Immunocytochemical assays detected expression of p16INK4a, p14ARF and p12 proteins in the cell clones. No specific signal was detected in the negative control (pcDNA3 vector-transfected cells). Growth arrest effects of the three transcripts were assessed by measuring the growth of the stably transfected clones over a period of 1 week at 24-h intervals. Figure 3a shows a reduction in the growth rate of cells transfected with p16INK4a, p14ARF, and p12 compared with the control group after day 3. During the following 3 days, the growth suppression effects became even more pronounced. As seen in Figure 3b, on the final day of cell counting, proliferation of the cells carrying any one of the three transcriptional variants was significantly inhibited compared to cells carrying the empty expression vector. Moreover, p16INK4a had a greater suppressive effect than p14ARF and p12. Cell growth inhibition and cell cycle redistribution analyses of stably transfected A549 cells. a. Cell growth curve analysis in one representative experiment. Data shown are the mean ± standard deviation of triplicate wells. b. Comparison of cell growth inhibition effects of p16INK4a, p14ARF and p12 on the final day of cell counting, based on three independent experiments. It was shown that all three transcripts significantly suppressed cell growth compared with the empty vector, but p16INK4a had the strongest effect. Error bars represent the standard deviation. * p < 0.05, ** p < 0.01. c. The percentage of stable clone cells at each stage of the cell cycle 48 h after subculture. p16INK4a and p14ARF induced clear G0/G1-phase accumulation and a decrease in the number of cells in S phase. p12 did not have a significant effect on the A549 cell cycle. Data shown are the mean ± standard deviation of three independent experiments. * p < 0.05. To determine the mechanisms responsible for cell growth suppression, the stable transfected cells were analyzed by flow cytometry, which allowed comparison of the cell cycle distribution of the cells after 48 h of subculture (Figure 3c). 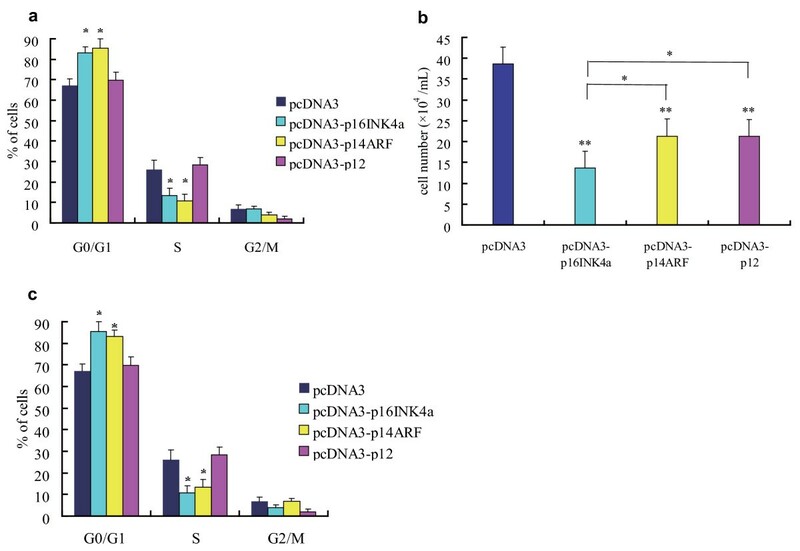 Both p16INK4a and p14ARF induced marked increases in the number of cells in G0/G1 phase and a decrease in the number of those in S phase, whereas pcDNA3-p12-transfected cells shows no significant cell cycle changes. Since p16INK4a had the greatest growth suppressive effects, the protein was investigated in further studies, described below. To produce exogenous p16INK4a protein, plasmid pQE31-p16INK4a-BL21 was generated and confirmed by DNA sequencing. 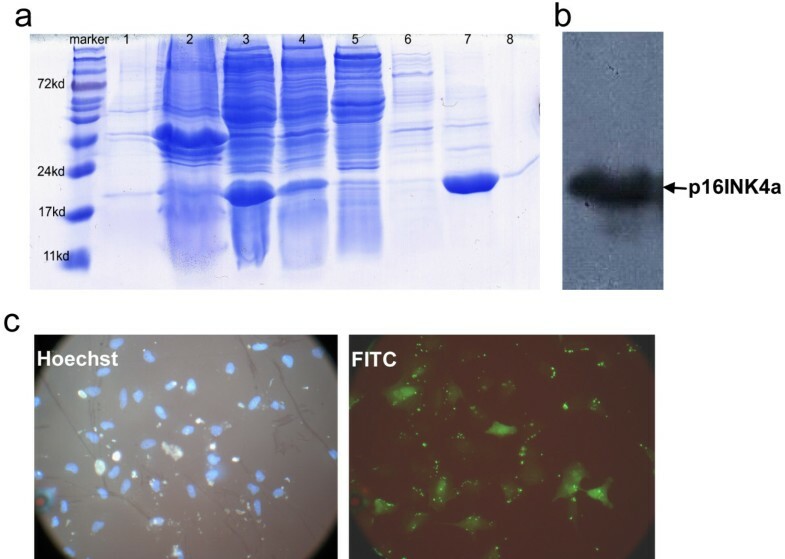 Figure 4a shows the almost complete absence of bacterial protein expression before IPTG induction, whereas after induction, a His-tag fusion protein of approximately 20 kDa was produced that was present in abundance in the supernatant of an extract prepared from the bacterial cells. For protein purification, the supernatant was loaded onto a Ni2+-affinity chromatography columns and cell proteins eluted with different concentrations of imidazole. The target protein was found to be enriched in the 100 mM imidazole eluent. All samples were analyzed by 12% SDS-PAGE. The p16INK4a fusion protein was further verified by Western blotting using a specific anti-p16INK4a antibody (Figure 4b). Purification, verification, and transduction of exogenous p16INK4a fusion protein. a. Successful expression and purification of the p16INK4a fusion protein was confirmed by 12% SDS-PAGE analysis. The bacterial sample before IPTG induction showed almost no protein expression (lane 1). After IPTG induction and centrifugation, p16INK4a fusion protein was abundant in the clear supernatant (lane 3) (indicated by the arrow) and absent from the bacterial precipitate (lane 2). The supernatant was loaded onto a Ni2+-affinity chromatography column, which binds the His-p16INK4a fusion protein. Nonspecifically bound proteins were removed with washing buffer; the flow-through liquid can be seen in lane 4. Elution buffer with different concentrations of imidazole was used to elute the p16INK4a fusion protein: 20 mM (lane 5), 50 mM nt (lane 6), 100 mM (lane 7) and 200 mM (lane 8) were. The fractions were assessed by SDS-PAGE and the sample corresponding to the 100 mM imidazole eluent (lane 7) was found to contain p16INK4a fusion protein of high purity (arrow). b. The purified protein was verified by Western-blot analysis using the specific p16INK4a antibody. c. Immunocytochemical assay to assess transduction efficiency. All nuclei of A549 cells stained with Hoechst fluorescent and the exogenous p16INK4a protein was detected in about 50% of cells, as shown by the FITC signal. As shown in the figure, the transduction efficiency was about 50%. 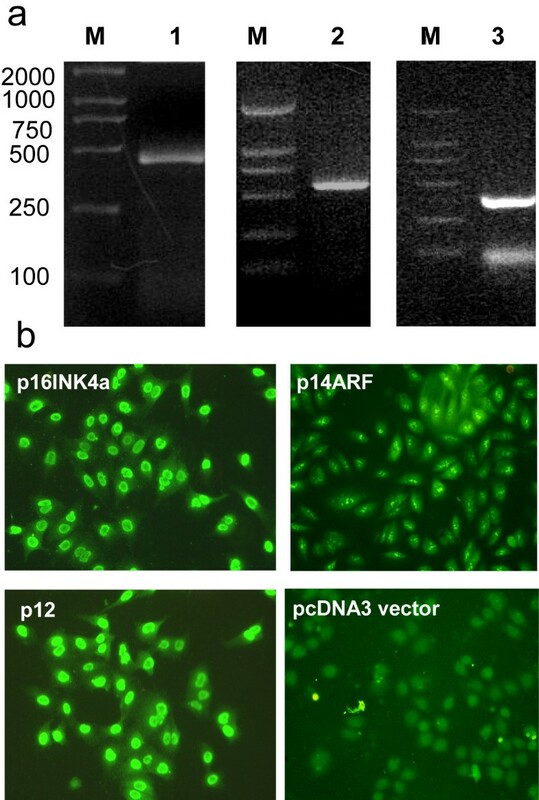 Purified p16INK4a fusion protein was transduced into A549 cells and transduction efficiency was examined by fluorescence immunocytochemistry. As shown in Figure 4c, all A549 cell nuclei were positive for Hoechst fluorescence and about 50% were positive for FITC, indicating that these cells had been successfully transduced with p16INK4a. To evaluate the effect of p16INK4a on cell growth, the growth curves of A549 cells transduced with the protein were compared with those of control cells (A549 cells incubated with Lipofectamine 2000). Cells transduced with p16INK4a the day before the start of the experiment were counted at 12-h intervals. Figure 5a shows that, 36 h after cell subculture, p16INK4a began to induce growth retardation. At 72 h, p16INK4a had significantly suppressed proliferation compared with the control (Figure 5a, b). Furthermore, cell cycle changes, as analyzed by flow cytometry (Figure 5c), showed that the presence of exogenous p16INK4a resulted in a marked retardation of the G1→S transition of A549 cells 48 h after transduction. Cell growth inhibition and cell cycle redistribution effects of p16INK4a in A549 cells. Cell growth curve in a representative experiment (a) and analysis of the differential inhibition effects of the three variants in three independent experiments carried out after 72 h of subculture (b). Significant growth retardance was exerted by p16INK4a compared with the control. The protein was transduced the day before cell counting. Data shown are the mean ± standard deviation of triplicate wells or experiments. **p < 0.01. c. p16INK4a protein caused evident accumulation of A549 cells in G1 phase and a decrease of those in S phase at 48 h after subculture. Data shown are the mean ± standard deviation of three independent experiments. *p < 0.05. As a tumor suppressor, CDKN2A is an important gene because its inactivation abrogates two fundamental pathways, that of pRB and p53, both of which are involved in carcinogenesis and tumor progression. So far, the distinct tumor suppressive effects of p16INK4a and p14ARF have been established, but those of p12 have not. Furthermore, to the best of our knowledge, the effects of the three transcripts have not been compared. The human A549 cell line is a good model to investigate the suppression effects of each of the three transcript variants. The advantages of this cell line are as follows: First, the CDKN2A locus is homozygously deleted in this cell line, such that there is no interference from the endogenous proteins. This is an important consideration since the effects of p16INK4a were shown in a previous study to be associated with endogenous p16INK4a status [23, 24]. Previous research in our laboratory also demonstrated that introduction of p16INK4a neither suppresses growth nor decreases colony formation rates by Anip973 and AGZY83-a cells expressing endogenous wild-type p16INK4a . Second, the A549 cell line is wild-type in RB and p53. Therefore, p16INK4a and p14ARF plasmids can be expected to successfully act on the pRB and p53 pathways. As to the methods used in this study, the use of stable transfectants confers several advantages as it eliminates a source of variability in transfection efficiency, which facilitated parallel comparison experiments. Furthermore, the characteristics of cells stably transfected with p16INK4a have been shown to differ from those transiently transfected with the vector; transient p16INK4a transfection induces apoptosis whereas stable transfection markedly suppresses cell growth and cloning efficiency . Research on p12 has been hindered as the gene is expressed in normal pancreas tissue, which is difficult to obtain in a well-preserved state. We successfully constructed a eukaryotic expression vector carrying p12 and were thus able to show that the gene acts as a proliferation inhibitor in A549 cells. Thus, our research provides evidence that p12 has tumor suppressive effects not only in pancreatic and cervical cancer cell lines, as previously reported, but also in a lung cancer cell line. The effects of p12 on other cell types will be investigated in future studies. Interestingly, however, p12 had no clear effect on the cell cycle of A549 cells. This finding is in accordance with the report that p12 cannot bind cyclin-dependent kinase CDK4 and acts in a pRb-independent manner . The exact mechanism by which p12 suppresses cell growth remains to be determined. The p12 expression plasmid constructed as part of this study will facilitate investigations into the mechanistic pathway of this transcript. The different growth suppressive effects of the three transcripts and the possible mechanisms responsible for these differences were compared in growth arrest experiments and by cell cycle analysis. All three transcripts showed significant growth arrest effects compared with the control. Specifically, p16INK4a and p14ARF caused marked G1-phase accumulation and a decrease in the number of cells in S phase, both of which explain the observed growth inhibition. Notably, p16INK4a had the greatest growth suppressive effect among the three variants while the effects of p14ARF and p12 were similar. This result provides meaningful information in the context of tumor suppressor selection, especially in cells in which CDKN2A is inactivated. As an important complement to gene therapy, protein therapy has its own advantages and its future applications are promising. The administration of protein therapeutic agents has proved to be feasible and effective both in vitro and in vivo [27–29]. In the present study, p16INK4a was exogenously expressed and purified and its tumor suppression effects verified in the A549 cell line. This protein is of interest for the following reasons: First, p16INK4a more effectively inhibited cell growth than either p14ARF or p12. Second, p16INK4a has a low molecular weight, which makes it suitable for protein therapy applications. Third, in contrast to other proteins such as p53, which is involved in a broad range of biological activities, p16INK4a specifically binds CDK4/6. In the present study, the protein was successfully purified and demonstrated to inhibit the proliferation of A549 cells in vitro. The structure and function of p16INK4a will be studied in further investigations, which are likely to provide insight into the use of this protein as a therapeutic agent. Our research is the first to show that, although all three transcripts of the CDKN2A gene can suppress the growth of lung cancer cells with an inactivated CDKN2A locus, they have different effects, with the growth inhibitory effect of p16INK4a being the strongest. Inhibitory effects on cell growth by p16INK4a and p14ARF, but not by p12, involve cell cycle redistribution. Thus, p16INK4a may be a candidate agent for cancer biotherapy. Wei Zhang, Jing Zhu, Jing Bai contributed equally to this work. This work was supported by The Scientific Research Foundation for Junior Scholars (1151G025), Heilongjiang Province, China. WZ carried out plasmids construction and stable transfection, cell growth and cell-cycle analyses. FL and AL performed fluorescence immunocytochemistry experiments. HJ, PL and GJ carried out protein expression, purification and transduction experiments. RG and WJ carried out western-blot analyses. JZ wrote the manuscript. XM and DS helped in the modification of the manuscript. JB, YY and YJ participated in the design of the study. All authors read and approved the final manuscript.